This is going to be a merciless fight! The Armageddon really has occurred. Nearly nothing was left. Only a few survived. These survivors are now called The Graveholds. On the other side, there are still The Nameless, mighty creatures, but a Nemesis to the Graveholds. The Gravehold survivors had taken refuge in an ancient and haunted place for generations. In the darkness they were seeking, trying to find a way back to light. It took them an Aeon and the help of the breach mages to improve their dark crafts and develop a lethal power in order to attack the relentless creatures of The Nameless. 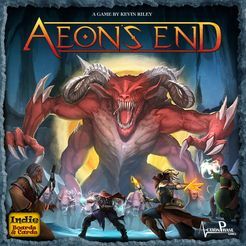 Aeon´s End by INDIE BOARDS & CARDS is about this fight. 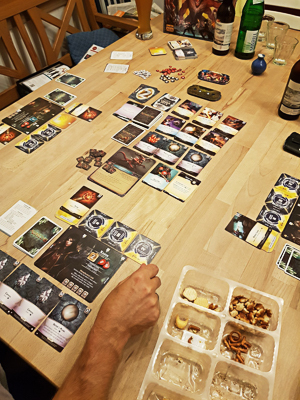 It is a cooperative deckbuilding game in which one to four players try to defeat an overwhelming Nemesis - Goddess of Redemption. They must fight fiercely and be quick, before they are too exhausted and before their home The Gravehold is overrun. Players take control of the breach mages who use gems and relics to prepare and cast spells in opened or closed breaches in order to attack the antagonist and his minions. Gems are the primary source for gaining aether, the currency of the game; relics, on the other hand, have various effects that are resolved as soon as they are used; spells are the primary source of attacking the Nemesis and its minions and must be prepared to a breach in one turn in order to be cast in a later turn. Each round, the players and the nemesis take turns in random order, so players never know, who is going to be the next combatant to strike an ugly attack. It might be one of the players or the Nemesis. And this variable turn order is determined by a special turn order deck that simulates the chaos of an attack. The game's main mechanic is a typical deckbuilding one, quite similar to Dominion. Players start the game with a starter deck, and by “buying” new gems, relics or spells from the supply, they gradually improve their deck and their powers. New cards are immediately placed on the discard pile, and at the end of a player's turn used cards (but not the cards still in hand) are placed on top of the discard pile too. This chronological order is important, because players never shuffle their decks, even if there are not enough cards to draw any more! Instead, in this situation the discard pile is flipped over to form the new drawing deck. But the similarity with Dominion ends here. Like in Thunderstone players don´t try to collect the most valuable cards to score in the end, but they rather try to defeat the nemesis and its minions. 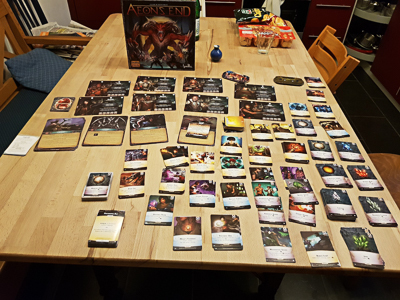 As I said before, Aeon´s End is a cooperative game, thus players try to reach maximum strength to complement each other in a combined fight, heading to win the bloody encounter together. Unlike a lot of other deckbuilding games, the starter decks in Aeon´s End are different for every player from start on. The mages also have their own, unique abilities, although these are not available right from the start. Instead they have to be charged first over several rounds in order to be activated once. Although this takes some time, it is worth it, because, for example, these abilities can heal a player, boost up the power of a spell or prevent a player to be damaged. On their turns, players are asked to come to an agreement on which actions each player performs. Only with a good coordination players will be able to optimize their attacking powers and supportive capabilities. A very useful item, and an eyecatcher too, are the player mats of Aeon's End. They represent the different characters of the breach mages, and more important, they also serve as control panel for each player to keep track of the prepared spells, the mage's health condition, his or her special abilities and the current status of charge. A turn of Aeon´s End is divided into a casting phase, a main phase and a drawing phase. In the casting phase, a player either has to cast an earlier prepared spell or he may do so. Whether he or she is forced to cast the spell or not depends on the status of the breach the spell is prepared in. If a breach is open, the prepared spell may be cast, if the breach is closed, the spell must be cast. At the beginning of the game every breach mage has a given configuration of open and closed breaches. Sometimes it is advantageous to have open breaches but otherwhiles it is better if the breach is closed. Changing a breach from the closed to the opened status takes several steps, and this focussing on the breach costs a lot of aether too. As a result a player should think twice about these expensive status changes, all the more because aether is short, like in real life. In the main phase, players may play gem or relic cards, acquire new cards or charge, focus or open a breach, prepare a spell to a breach or resolve effects on the nemesis or the corresponding minions. In this way, a breach mage improves his or her deck, loads up his attacking powers and reduces the power of the nemesis, if possible. In the drawing phase, the used and acquired cards are placed on the discard pile, and new cards are drawn from the top of a player's drawing deck until he or she has five cards in his or her hand again. Because of the various effects of the different gems, relics and spells, this is only a rundown of the player's turn. Now let's take a closer look at the repellent part of Aeon´s End: The nemesis turn! Whenever the turn order deck announces the nemesis´ turn, two phases are carried out: the main phase and the draw phase of the Nemesis. In the main phase, all effects of the already revealed minion- and power cards of the Nemesis are resolved. Because the Nemesis and its minions aren't the most companionable enemies, the effects are definitely not for the benefit of the breach mages and The Gravehold. Usually the breach mages or The Gravehold will suffer damages or other destructive events occur, like a powering up of the nemesis itself. The nemesis cards come into play in the drawing phase. The Nemesis has its own deck of cards that consists of nemesis specific and basic cards. The deck is divided in three parts that increase in difficulty as the game progresses. 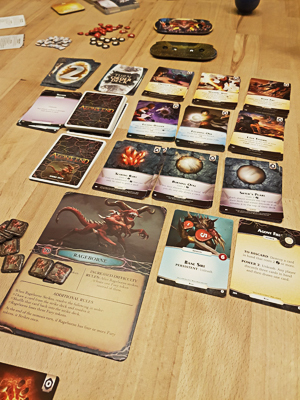 In this drawing phase, new nemesis cards are drawn from the deck, and are placed next to the nemesis mat. The effect of the cards either occurs immediately, some effects are persistent and some evolve only after a given number of rounds. Some cards also have an “to discard” effect on them. This can be very annoying, if you already have planned your next turn and therefore, the breach mages should concentrate their powers wisely in order to withstand these discard cards. You will understand, that the random play order makes the gameplay pretty much unpredictable! Sometimes the danger seems to be calculable, and the players expect they can deal numerous damages to the nemesis, but in the next moment, the Nemesis gets two consecutive turns, and the situation completely changes. All of a sudden there are many new severe minions and new threats to defeat. I really love this game! In my opinion it has a great gameplay. The author Kevin Riley combines the brownie points of Dominion and Thunderstone, and develops them further. 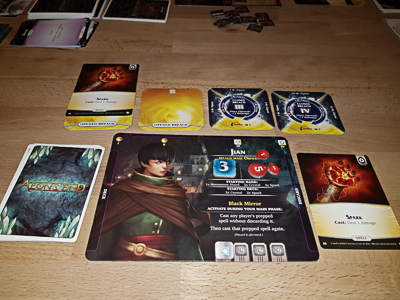 The deckbuilding mechanism in combination with the breach mages' variable characteristics and powers, as well as the cooperative style makes Aeon´s End nearly addictive. Additionally, the material and the illustrations of the game are really excellent. The game comes with four different Nemesis characters and their corresponding card decks. On the other hand, there are eight different breach mages with their variable powers and unique characteristics. Every breach mage has his or her own background story described on the players mat, and each Nemesis has special rules and an unique attacking power that corresponds with its specific card deck. The richness of detail is really stunning. Like in Dominion the replayability is rather good, because next to the main actors and powers, the equipment of the different gem, relic and spell cards is also very extensive. I can really recommend Aeon´s End to all players, who like to struggle a merciless fight! Well, stop talking, start fighting!